Differentiation is tough for smartphone makers. The dirty little secret is that most handsets are pretty good these days. Fast processing, hi-res screens, good cameras. Sure, some are certainly better than others, but even the bad ones are capable of things unthinkable on a mobile device not all that long ago. Heck, at the top of the heap, premium handsets are all starting to look the same. Over the years, Motorola’s done a commendable job setting itself apart — and from the looks of it, the company’s acquisition shows no signs of abating under its relatively new Lenovo umbrella. On numerous occasions, the company has eschewed hardware arms races to focus on important — but oft-overlooked — aspects of handset manufacturing. Things like ruggedness and battery life, which other manufacturers often ignored as they attempted to out-pixel one another. 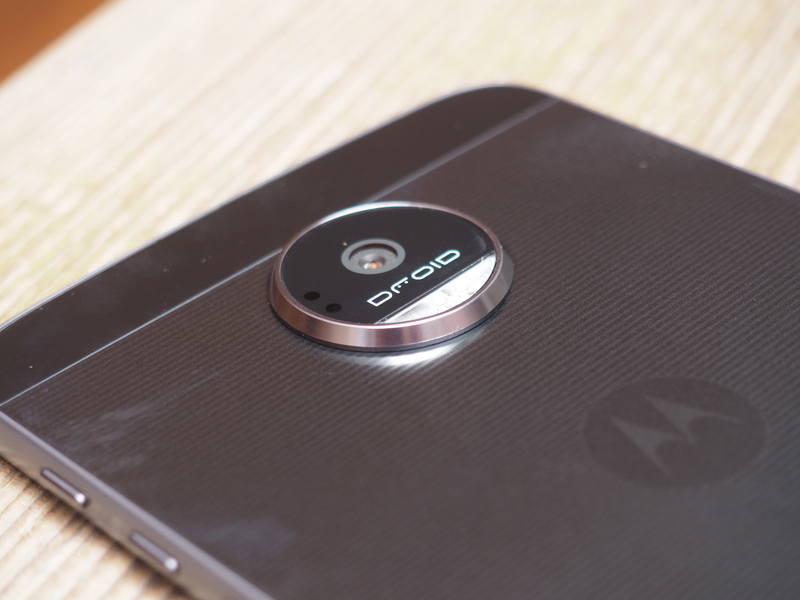 The company has also done an admirable job offering high-end specs at budget prices with its Moto G line. If nothing else, modularity presents distinction from the unwashed smartphone throngs. Plenty of hardware makers have expressed interest in what purports to be the next major step in smartphone evolution, but of them, only LG has followed through. And the G5’s aluminium casing landed with a dull thud, thanks in small part to an utter lack of actual modules — which is kind of like the smartphone equivalent to launching a console with no games. Motorola has certainly presented more forethought on that front, at least. After all, the company has been thinking about smartphone modularity at least since its Google days, when the company was attached to Project Ara (nee Phonebloks). 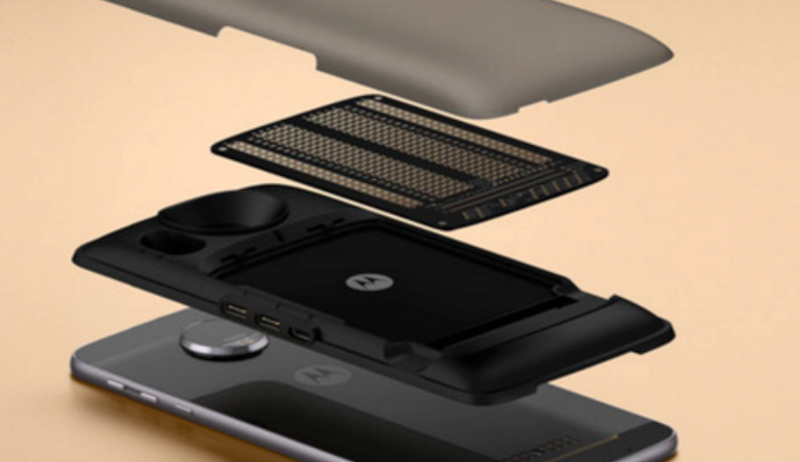 Of course, the Moto Z (along with the moderately higher-end Moto Z Force) is a much more measured approach to the concept, trading in smartphone building blocks for a removable back. It’s less exciting, perhaps, but building such functionality into a solid piece of smartphone hardware means there’s less room for things to go horribly awry. I’m honestly a bit surprised to say that I actually quite like the Moto Z’s hardware design when the handset is divorced of its back plate. At 0.2 inches, the thing is rail thin. My iPhone 6s is downright chunky in comparison. It’s an impressive bit of hardware engineering, particular from a company whose trend-bucking handsets often weigh in on the beefy side of the spectrum. Of course, there’s a sizable caveat to all of this seasonally appropriate thinness — the massive camera that’s one of the largest we’ve seen on a handset in some time. The up/downside is that the bump essentially disappears when you pop off the compatible backings on the rear of the device, rendering it either flush or, in the case of the more complex plug-ins, recessed. That also means, for pretty much all intents and purposes, that the phone is going to be thicker than 0.2 inches for most of your time with it. With the included wood-paneled backing on the device, it’s notably thicker than the aforementioned iPhone. From the front, the phone looks a fair bit like the Moto G4 Plus, with rounded square edges, a thin bezel on either side and a square fingerprint reader below the 5.5-inch display, just below a small “Moto” logo, which was left off the G4. Up top is a five-megapixel camera with its own flash for all of those nighttime selfies. 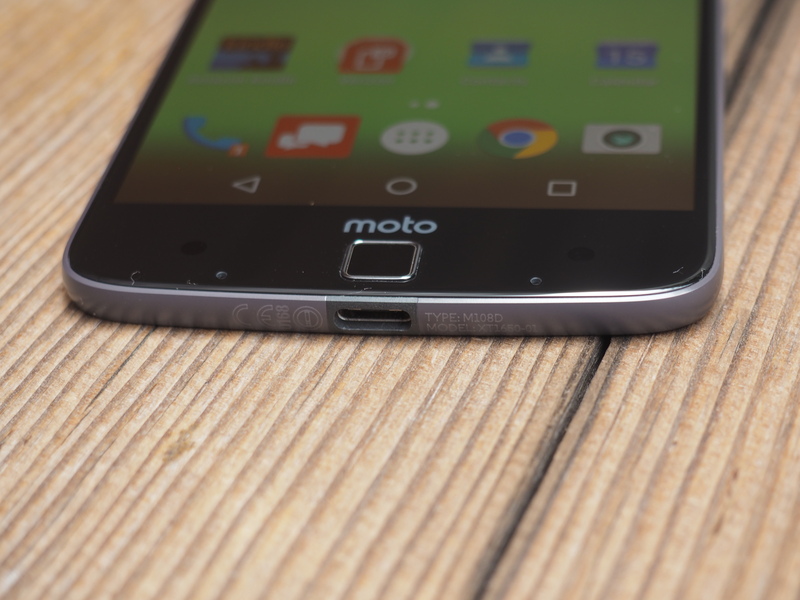 At 4.8 ounces, the Moto Z is lighter than the G4 Plus, but the build feels substantial. Once again, the company eschews the unibody form factor that has become all the rage among the competition, for construction that looks premium. A step up, certainly from the company’s more budget-focused fare. 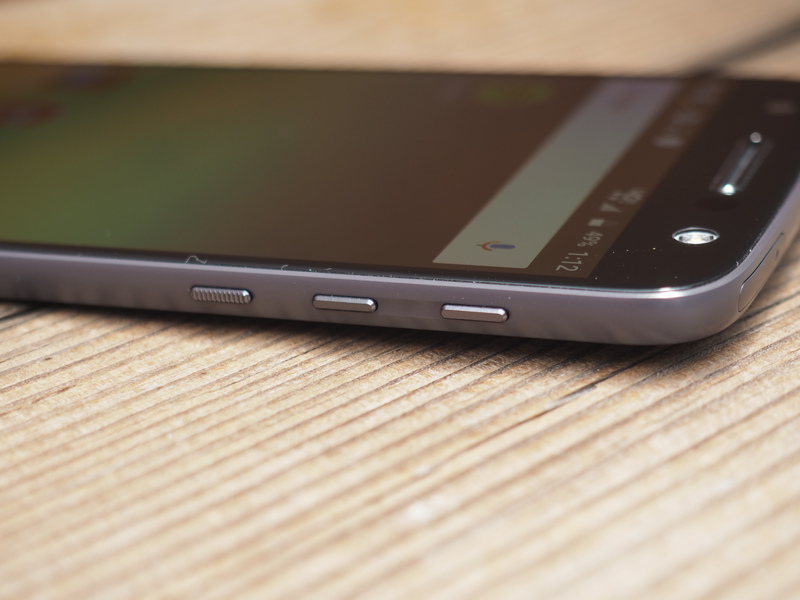 The sides are encased by a metal band housing the USB-C port on the bottom and the power button and two individual volume rocker buttons. The former has a slightly serrated surface to distinguish it, but with three buttons of the same sized housed together, it’s easy to fumble for the wrong one. Oh, and there’s not a headphone jack to be found. In what feels like a bleak portend for things to come, Motorola’s beat a number of competitors to the seemingly inevitable punch, requiring either a Bluetooth connection, USB-C headphones or an awkward adapter to listen through headphones. The move no doubt helped the company slim down the device’s profile, but for many, the thinness will come at the price of a new pair of headphones. The rear features a thin, striped pattern flanked by two big, black bars. There’s a Motorola “M” in the middle, but the device is, thankfully devoid of Verizon branding (the same, sadly, can’t be said for the software). 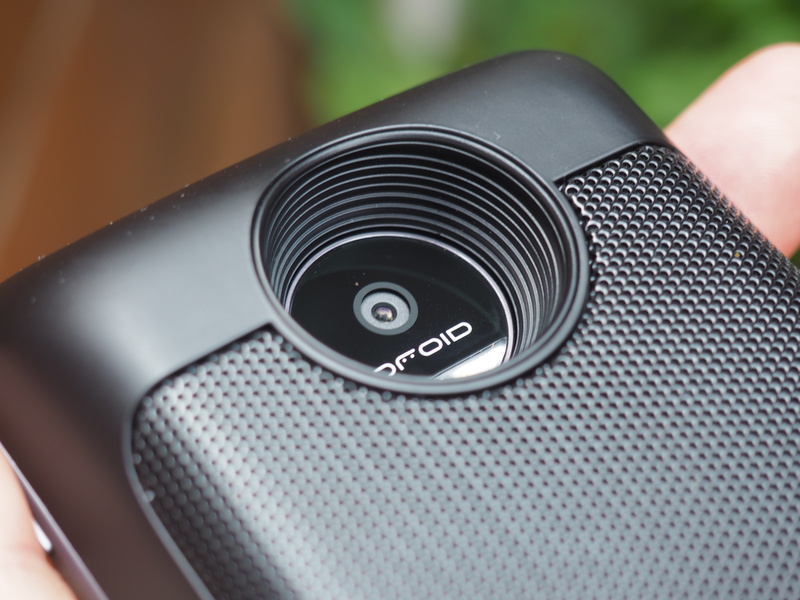 The closest you get is the Droid logo in the middle of the aforementioned camera bump. It is, fittingly, the only logo that shows up after a back has been snapped on, though Motorola, unsurprisingly, made sure to include the “M” on all of its own proprietary backs. Of course, you won’t be seeing most of that backing most of the time, so a lot of this is ultimately a moot point, thanks to those 16 metal pins at the bottom. So, let’s talk modularity. It’s divisive. Understandably so. It feels gimmicky, and thus far no one has done a good job demonstrating otherwise. 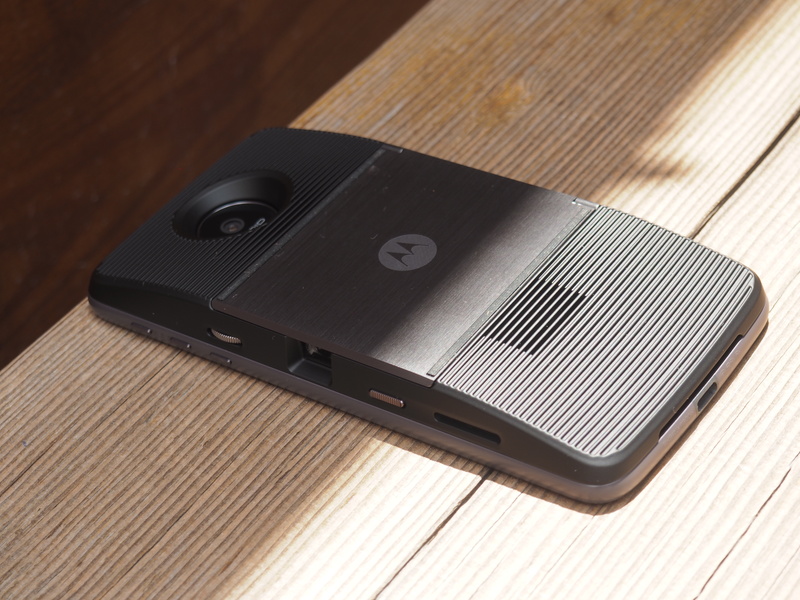 The Moto Z unquestionably goes the longest toward establishing some sense of legitimacy around the concept, but the bar is fairly low, and compared to where the company started with Project Ara, this form factor is more akin to dipping one’s toes in the modular waters. On the most basic level, the Mods offer a sort of customizable take on the company’s longstanding Motomaker offering, with a slew of different backings that snap on magnetically, so users can switch out to their heart’s content and swap backings with other compatible devices. The cases snap on firmly and take a little prying to get off, though a small drop on a carpeted floor quickly demonstrated that they likely won’t offer a heck of a lot of protection in a serious spill. What makes the system more inherently modular than just, say, a series of cases, is how the Mods interact with the phone itself. Once snapped into place, the devices establish a connection, circumventing the need to pair any Bluetooth or plug anything into the USB port. The display also offers up key information like how much of a charge is left in the Mod’s tank. 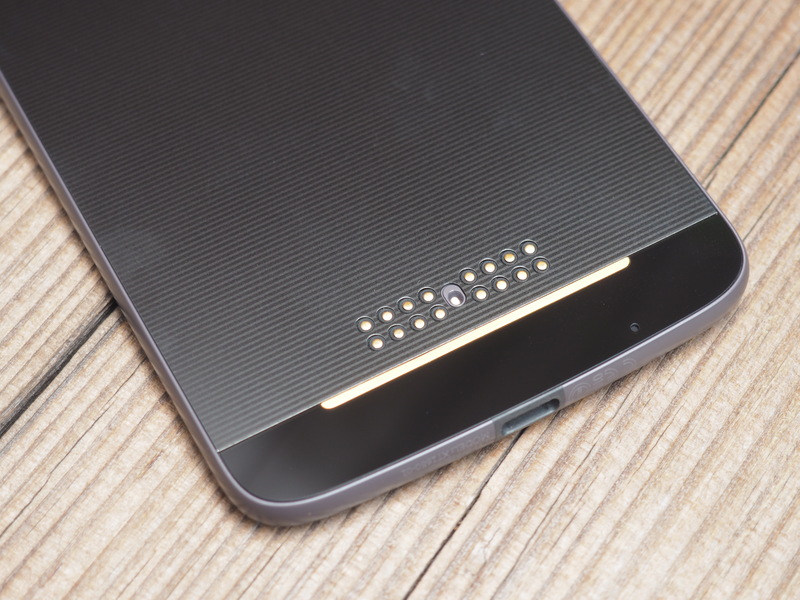 Motorola clearly learned from LG’s mistakes here and is launching with some key Mods. The most useful of which is, without question, Incipio’s Offgrid Power Back, which adds an additional 2220 mAh battery to the Z’s solid 2600 mAh. Thus far, the battery pack is the most compelling argument for the handset’s modularity, bringing a key feature to the handset without adding too much in the way of the additional bulk you’ll get from a Mophie or other battery case. I’m also a fan of the JBL Harm SoundBoost, a speaker Mod with a built-in kickstand that brings a lot of audio firepower to the table. It’s not quite up to the standards of a standalone Bluetooth speaker, but it’s much fuller and clearer than what’s built into the Z — and it’s a lot more portable than attempting to carry a standalone speaker in your pocket. Another plus: the speaker’s got its own built-in battery, promising 10 hours of life on a charge (via the USB-C port on its back). 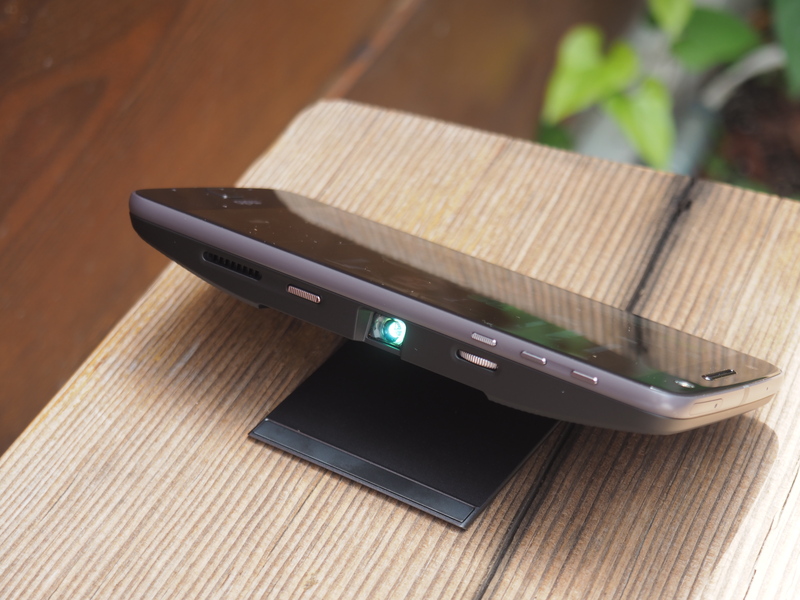 The Moto Insta-Share Projector, while neat, is easily the most niche of the bunch, essentially tacking a pico projector onto the back of the device. Like the JBL speaker, it adds considerable girth to the handset, so it’s certainly not the kind of thing you’re going to want to carry around in your pocket for everyday use — unless you’re really, really keen on projecting stuff wherever you go. The projector displays whatever is on the phone’s screen with the push of a button (the phone screen will also continue to display by default for some reason, though a privacy button ensures that notifications won’t show up on the projection). It’s capable of projecting images up to 70 inches, which are sharpened via a small dial on the front. As one expects from a pico projector, the Insta-Share isn’t much to speak of in daylight, but it does the trick in a dark room. Folks with a lot of business presentations will likely get some good mileage out of it, but for most users, its appeal doesn’t extend much beyond the occasional mini-movie screening. 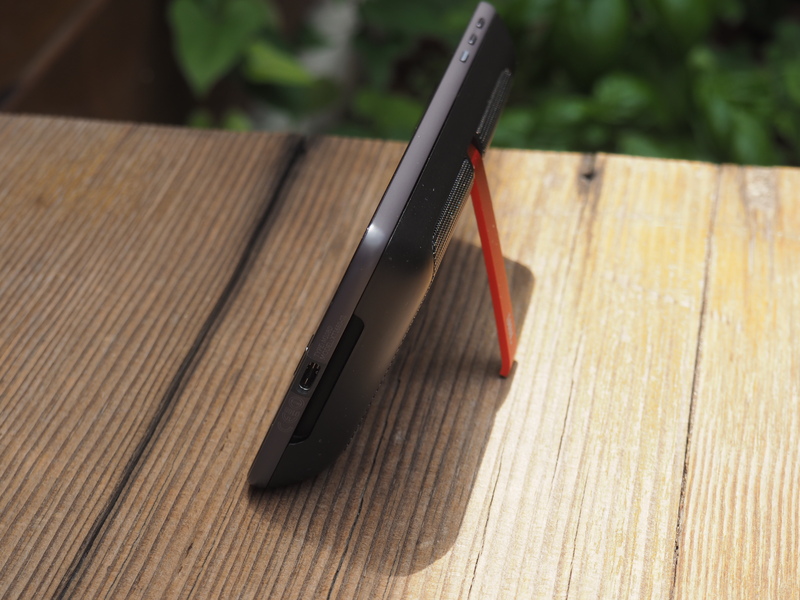 As with the JBL, there’s also a kickstand and battery (11 mAh) on board. The current offers are, at best, compelling, but in most cases, they don’t go too far beyond what you can get with a specialty phone case. Of course, with the Moto Mod Developer Ecosystem, the sky is, potentially the limit. How many third-parties plan to get on-board, however, is a key question. Points to Motorola for not skimping on the hardware, even as the novelty of the Mods understandably takes center stage. The 5.5-inch AMOLED display is a stunner, clocking in at 2560 x 1440, which works out to 535 ppi. That’s roughly what you get on the Samsung Galaxy S7 Edge and is well over the iPhone 6S Plus’s 401. The speakers, too, are surprisingly beefy for a mobile device, though if you’re looking to listen without headphones, definitely take a good long look at JBL’s offering. The camera, meanwhile, is jam-packed. The standard Z gets you a 13-megapixel on the rear, which should be plenty for most (though paying a premium will bump things up to 21). Motorola’s done a good job compiling many of the company’s best camera features here, including a slew of autofocus technologies and low-light technologies and robust camera software. The functionality clearly wasn’t an afterthought. Unlike the G4, a fingerprint reader is standard on both devices, waking the system up in a snap. The on-board Snapdragon 820 is zippy, when coupled with the standard 4GB of RAM. Storage is either 32 or 64GB, but that can be augmented a plenty, courtesy of the expandable microSD slot. And then there’s the matter of price. 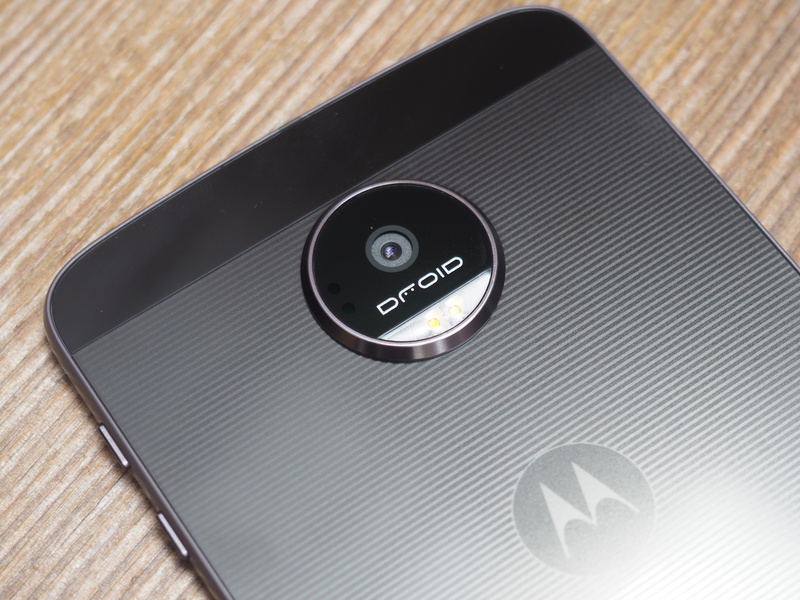 The Moto Z Droid Edition runs $624, with the Force priced at $720. Naturally, you can also opt-into Verizon’s month device plan at $26 or $30, respectively. That’s not crazy, but things start to add up fast. The SoundBoost Speaker runs $80 and Moto’s projector is a lofty $300. It’s also, unsurprisingly, loaded with Verizon apps most users won’t look at a second time, not to mention all the other baggage that comes with being a carrier exclusive. From a hardware perspective, there’s a lot to like here, but the Moto Z’s ultimate success will likely hinge less on what’s inside than out. And while Motorola has done a better job offering up launch partners than some, the health of the Mod Ecosystem still feels like a wildcard.